Current research efforts in biosensor design attempt to integrate biochemical assays with semiconductor substrates and microfluidic assemblies to realize fully integrated lab-on-chip devices. The DNA biotransistor (BioFET) is an example of such a device. The process of chemical modification of the FET and attachment of linker and probe molecules is a statistical process that can result in variations in the sensed signal between different BioFET cells in an array. In order to quantify these and other variations and assess their importance in the design, complete physical simulation of the device is necessary. Here, we perform a mean-field finite-element modelling of a short channel, two-dimensional BioFET device. We compare the results of this model with one-dimensional calculation results to show important differences, illustrating the importance of the molecular structure, placement and conformation of DNA in determining the output signal. Contemporary nucleic acid sequencing tools rely on optical DNA microarrays to detect successful hybridization. Due to its high cost, lack of portability, and use of labelling agents, research attention is focused on developing fully electronic, label-free DNA biosensors. Several possibilities have been investigated for such sensors, including DNA-sensitive electrodes [1–3], DNA transistors [4–7], cantilever beam DNA sensors [8, 9], optical label-free sensors  and nanowire and nanobead DNA sensors [11–13]. All of these methods have been shown to selectively sense complementary target DNA strands. For these devices to be commercially used, they must exhibit a high degree of repeatability and stability in their output signals. The noise contributions of the devices place an upper limit on the sensitivity of the sensor . This includes electronic noise sources, noise from the reference electrodes, and noise from the random electrochemical processes. On the other hand, variations in the device due to the number, placement, and orientation of probe and linker molecules can have adverse effects on the sensed signal and can therefore cause signal variations between different cells in an array. These variations are much more significant with nanoscale sensors, where the conformation of molecules can severely distort the output signal. To investigate the relative magnitudes of these signal variations, a model for the response of the biosensor must be formulated. In the case of the BioFET, a mean-field 1-D model for the semiconductor surface potential response was previously developed  and subsequently used to construct a complete 1-D model for the biotransistor [14, 16], as well as a simplified analytical model . A 2-D cylindrical model of the DNA and surrounding ionic cloud was also developed . 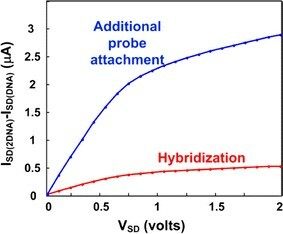 In the cylindrical model, the sensitivity of the BioFET to hybridization was calculated by pinning the semiconductor’s channel to a certain surface potential such that a certain current is maintained, while varying the source voltage. This approach ignores the variations of the semiconductor’s charge distribution along the device’s length. Additionally, such a model would not allow the investigation of weakly inverted devices, as the channel’s charge modulation is taken as a linear indicative of conductance modulation and hence, sensitivity. Here, we perform 2-D finite-element simulations on the entire BioFET structure, including the semiconductor’s channel. The complete simulation allows the effects of DNA charge discretization to be reflected onto the semiconductor’s channel. Furthermore, for nanoscale MOSFET, the effects of source-channel and drain-channel depletion region modulation by DNA are taken into account, thus giving a more realistic view of the total response of the device. This paper is organized as follows: Section “Model Details” discusses the structure of the model, the mathematical equations, and the boundary conditions. Section “Results and Discussion” introduces and discusses the results of the simulations as applied to several cases of interest. Finally, section “Biosensor Design Implications” provides some design guidelines to optimize the operation of a DNA BioFET. The model of a BioFET consists of a FET structure, including a source diffusion, a drain diffusion, the substrate, the channel, and an insulator. Instead of a polysilicon gate, the BioFET employs an electrolyte solution and a reference electrode. The conductive electrolyte is needed to facilitate DNA immobilization and hybridization on the insulator’s surface, whereas the reference electrode allows a potential to be applied to the solution that will subsequently act as a gate contact to invert the semiconductor’s channel. In the finite-element model, a 2-D frontal view of the BioFET is used as shown in Fig. 1. The DNA molecules are modelled as vertical rectangles of charge extending 10 nm into the solution (around 30 bp), and with a lateral width of 2 nm, corresponding to the diameter of the DNA double helix. The DNA molecules are assumed to be impermeable to solution ions, and the charge is assumed to be uniformly distributed within the DNA segments. In a study by McKinnon and Landheer , the DNA molecule was more realistically modelled as a cylinder with a permeable charge sheet. Such a model could be incorporated here, but it would render the problem three-dimensional, with a geometric increase in the demand for computational power. As the main purpose of this paper is to study variations in the sensitivity rather than its absolute value, the 2-D model will suffice. Aside from the geometry assumptions, there are several other assumptions to simplify the model. Firstly, the reference electrode is assumed to maintain a constant potential with respect to the solution and does not experience any drift. No possible chemical reactions of the probes or targets other than hybridization are modelled. Any effects of the buffer solution molecules, other than the salt ions, are ignored. Finally, the hybridization yield is assumed to be 100%, with complete equilibrium coverage. The simulated transistor is of 400 nm length and 1 μm width (modelled as a multiplication factor, due to symmetry of the device in this dimension), with sufficient depth to cover the depletion width vertically. The solution is modelled as a rectangular area enclosing the DNA, with sufficient depth to cover the double-layer structure at 1-mM 1-1 electrolyte concentration. The walls of the solution wells are modelled as a PDMS layer, with a dielectric constant of 2.5. The reference electrode and the metallic contacts to the source, drain, and body connections are not modelled. The reference electrode is assumed to be a nonpolarizable electrode with a stable electrode potential. All metallic contacts are assumed to be Ohmic contacts of low resistivity, such that they can be ignored in the simulation. In Eq. (1), V is the electrostatic potential (Volts), q is the electronic charge, ε is the permittivity of the solution medium, n 0 is the bulk salt concentration (cm−3), z is the valence of the ions, and β is the inverse thermal voltage (V−1). Although the PB equation is often linearised due to small interfacial potentials, the DNA duplex is a highly charged polyelectrolyte, and it creates interface potentials higher than the thermal voltage. In addition, the interfacial potential at the insulator is a function of the applied reference electrode bias and must therefore be treated by the nonlinear PB equation. where the vectors and are the hole and electron current densities, respectively, D p and D n are the hole and electron diffusion coefficients, respectively, and μ p and μ n are the hole and electron mobilities, respectively. Equation (3) states that at steady state, there is no net flux of either of the carriers. The carrier current is a summation of the diffusive term and the drift term. Carrier generation and recombination currents are ignored here. where nDNA is the volumetric density of DNA charges, given by 9.36 × 1020cm−3 for a single-stranded DNA. This value is calculated from the geometry of the DNA molecule. where W is the width of the BioFET. In the absence of body leakage current, the boundary chosen can be the source or the drain contact or any boundary in the path of lateral current flow, such as the boundary between the source diffusion and the body. Two sets of boundary conditions are required to solve the problem. For the entire structure, boundary conditions for the electrostatic potential are required. In addition, boundary conditions for the carriers within the semiconductor are needed. The boundary potentials must take the corresponding material phase into consideration, since Poisson’s equation solves only for the vacuum level of electrostatic potential (i.e. no chemical potential discontinuities are considered). Therefore, one must manually introduce these chemical potential differences into the boundary conditions. Failure to do so will result in the characteristics of the BioFET being shifted by the amount of the flatband potential. In Eq. (7), χM, χs, and χsol are the electron affinities of the metal contacts, the semiconductor, and the working ion in the solution (Cl− in case of an Ag/AgCl reference electrode), respectively, Eref is the reference electrode potential, which depends on the electrolyte concentration, Eg is the band gap of the semiconductor, and ϕF is the Fermi voltage of the semiconductor. It should be noted that the value of the Fermi voltage is different at the body boundary from its value at the source/drain boundaries. The case of the insulator–electrolyte interface is different. Due to the chemical activity of the surface SiO groups, these sites can attract protons from the solution, causing a surface charge. This charging is the main reason behind the sensitivity of ISFET devices to the pH value of the solution. The amount of adsorbed charge σ0 is dependent on the local pH value, which, in turn, depends on the local potential . However, in this simulation, these charges were not considered. This is not to de-emphasize their adverse effects on the sensitivity of the BioFET, but rather to focus our attention on the effects of discretization and placement of DNA charges within the BioFET. where ni is the intrinsic carrier density. Once again, the Fermi voltage is different at different boundaries, depending on the type and density of doping. All other external boundaries of the semiconductor structure are given reflective boundary condition, since it is not possible to overcome the potential barrier of losing carriers at these boundaries. At the boundary between the bulk and the source and drain diffusions, Neumann boundary conditions of continuous density gradients are imposed, due to the lack of any sources/sinks of carriers. The simulation was carried out using a commercial solver (COMSOL multiphysics). The finite element mesh was automatically generated for the structure, but with controlled distribution and increased density in the regions close to the insulator. However, due to the severe nonlinearities in the model, as well as the varying characteristic length scales, coupled multiphysics simulations are not easily solved. It becomes necessary to provide close initial estimates of the solution before the perturbed solution can be calculated. Another problem with the coupled simulation is that the ranges of the three solved variables (V, n and p) are very different, and their variations differ significantly within the BioFET. The potential V varies only in the range of ~1 V, with quadratic to exponential profiles, whereas the electron and hole densities vary in the range of ~1017cm−3, with variation profiles that are super-exponential. Such a huge difference in the variables makes it hard to choose an efficient mesh and results in much longer simulation times and larger errors. Therefore, in the thermal equilibrium case, a single nonlinear problem in the potential alone can be solved. The obtained solution can then be used as an initial guess in the solution of the perturbed case. However, this may still not be enough, and one might have to “soft start” the transistor starting from very low drain biases and with small increments, using the result of each simulation as an initial guess to the subsequent simulation. where the new variables are the quasi-Fermi potential for holes Vqfp and electrons Vqfn. These new variables vary in the same range as V, and the simulation is therefore faster and more accurate. The simulation parameters are given in Table 1. Current–voltage plots were obtained from 1-D  and 2-D simulations for comparison. Figure 2 shows the results for three different gate-source voltages. 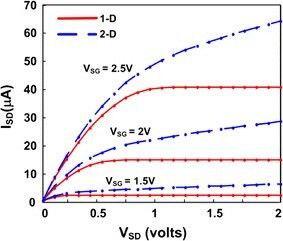 The threshold voltage of this BioFET is determined to be −1.3 V. The absence of the channel-length modulation effect in saturation is clear from these plots as the charge-sheet model used in 1-D simulations does not capture this effect, i.e. a long-channel model was used since the channel-length modulation factor is semi-empirical in its derivation. Additionally, the 2-D model predicts a higher current in deep inversion because the current is calculated along the entire depth profile of the channel (sub-surface conduction) and not based on a charge sheet as in the 1-D model. The BioFET signal is defined as the difference in the drain current between a surface with hybridization and a surface without hybridization. In the model, this is calculated by performing two simulations, one with double the DNA density of the other and calculating the difference in the observed current. Figure 3a shows simulation results of the BioFET current at different drain and gate biases. The 1-D simulation is seen to overestimate the observed signal, particularly at deep inversion. The reduction in sensitivity is explained by the lateral ionic shielding of the DNA molecule, which prevents the electric fields from causing additional inversion in the channel of the semiconductor. Such an effect cannot be quantified using a simple 1-D model for the BioFET. Furthermore, the ratio between the 2-D and 1-D simulations, shown in Fig. 3b, gives a minimum value close to 40%, illustrating that the 1-D simulation can result in an error of around 60%. For deep inversion, these results agree with those of McKinnon and Landheer , where it was stated that variations in the range of 50% are expected for the simulated range of electrolytic concentration and DNA density. However, the weak inversion result here shows that the 2-D model approaches the results of the 1-D model, emphasizing the importance of the 1-D model in determining the device’s sensitivity in low inversion. In any case, these results illustrate that the geometry of the biomolecule is an important factor and must be considered in modelling attempts. This is particularly important at high electrolyte concentrations and in deep inversion. The finite-element model has also been used to investigate the effect of the position of the probes along the channel of a nanoscale sensor. Figure 4 shows simulation results of the BioFET signal for different sample distributions of the probe molecules. Four such simulation sets were conducted, with the probes distributed (1) uniformly, (2) aggregated around the centre, (3) aggregated closer to the source terminal, and (4) aggregated closer to the drain terminal. The simulation shows that the uniform, sparsely spaced DNA probes give the highest sensitivity. This might sound intuitive as the conductivity of the BioFET channel would increase optimally when the charge increase is distributed along the direction of current flow (conductances in series). However, as the DNA probes are placed farther apart, the shielding ability of the ionic cloud increases, and one would expect that the effective amount of conductance change in the channel will be reduced. This is in contrast to the case with aggregated DNA probes, where the ionic cloud is not as efficient in shielding the charge of the DNA, and more localized inversion is thus expected. The simulation, however, shows that even for a short-channel BioFET, uniform distribution of inversion charges is more important. When the probes are placed closer to the centre, source, or drain, the sensitivity of the device is significantly reduced. The source and drain ends seem to be less sensitive to the DNA charge than the centre. This can also be explained by noting that the drain and source surface potentials are much harder to modulate by charges on the gate, as they are in electrical contact with the drain and reservoirs. The harder charge modulation makes it more difficult for the DNA targets to induce an electrical signal. In the case of the drain aggregated probes, another phenomenon is noticed. As the device is put in deep saturation, the BioFET is desensitized. The channel pinch-off in saturation is responsible for this. On the onset of saturation, the drain’s ability to draw charges is dramatically increased, and the lateral electric field becomes very strong. The weak modulation of the vertical electric field due to hybridization will not result in any significant change in the underlying local surface potential, and the BioFET is desensitized along this region. In this case, several probes that are in close proximity to the drain are made redundant and will only weakly contribute to the total current change. From Fig. 4, one can see that for any drain bias, placement of the probe DNA can change the sensitivity of the device by around 50%. The BioFET is, therefore, extremely sensitive to variations in DNA immobilization profile, which in itself depends on the lateral profile of the linker molecules. This is directly attributed to the asymmetric distribution of charges within the channel of the FET and places a limit on nanobiosensor design, where the channel is dominated by short-channel effects. For long-channel devices, the diffusion-controlled regions extend minimally over the channel, with the largest region of the channel being drift-controlled (resistive). The variance in probe placements will, therefore, not have detrimental effects on the operation of the BioFET, unless the DNA aggregation is severe. However, assuming purely entropic diffusion of probes during immobilization, such an aggregation is not likely to occur. A final observation using the 2-D model is regarding nonspecific charges. The sensitivity of the device to hybridization charges is quite different than to immobilization charges. This effect can be quantified only with complete geometric modelling of the immobilized probe molecules. In general, many different phenomena can contribute to signals that obscure the sensor’s signal. Examples include target adsorption by the linker molecules, spurious protein bindings, and ionic adsorption. The hybridization charge is localized at the same locations of the probes, whereas spurious adsorption can occur anywhere on the surface. Intuitively, one would expect that the spurious adsorptions might induce a smaller signal, because they increase the screening area for the charges and can thus be screened more efficiently (as opposed to sharing the ionic screening area with the capturing probe). However, the nonlinearity of the double-layer screening, as well as the more distributed inversion charge on the semiconductor due to the occupancy of vacant surface positions by the adsorbents, cause the corresponding BioFET’s signal to be higher by several times than the signal due to legitimate, specific target capture. Figure 5 shows simulation results of the BioFET’s current for complementary hybridization, as well as for spurious adsorption of molecules of similar structure carrying the same charge (modelled here by doubling the probe molecules’ density and distributing them evenly). The simulation shows more than fivefold increase in the sensed current due to erroneous charges. These erroneous bindings are often noncovalent and can therefore be rinsed away prior to making the measurements. However, the rinsing and replenishing processes can cause changes in the ionic characteristics of the solution; that might lead to more signal discrepancy. This also limits the potential use of this biosensor to monitor the kinetics and dynamics of the DNA surface hybridization. The preceding simulations can be used to monitor and quantify several effects and assess their significance to the design of the BioFET. These effects are to be considered as sources of random variations between the cells of fully electronic DNA microarrays. As mentioned previously, such effects are more pronounced in nanoscale sensors, such as sub-micron FETs. To minimize erroneous readings and variations, several measures must be taken at the chemical synthesis level, as well as at the circuit level. At the chemical level, the environmental conditions during the linker-building process, as well as the probe attachment process, must be carefully selected to ensure mean equilibrium spacings that are small in comparison with the device geometry. This will desensitize the sensor to the Brownian variance in positioning of the linkers and probes. However, care must be taken as a very dense DNA layer can severely hinder hybridization due to the steric barriers involved. Additionally, a very dense linker layer will transform the layer into the “brush” regime , possibly with serious conformation and DNA immobilization consequences. Thus, the exposure time for immobilization must be long enough such that statistical biases are not amplified but must not be too long to render the layer impermeable to targets. The unused linker molecules should be deactivated so that they only act as ionic barriers but not as energy wells for adsorption. At the circuit level, differential configurations should be used to eliminate all common sources of variations, such as reference electrode drift, solution’s pH or ionic strength variations, temperature, or nonspecific binding. The roles of the positive and negative BioFETs should be interchanged (via a chopper circuit, for example), to eliminate other common-mode biases due to fabrication or surface chemistry variations. 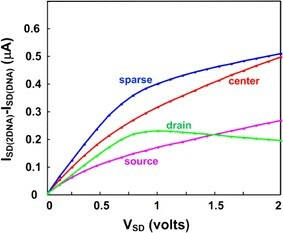 Finally, the symmetry of the MOSFET should be utilized in interchanging the roles of the source and drain terminals and averaging the readings out. This will minimize reading errors due to positioning variations of the probes. Drain potential sweeps can be carried out and compared to the model to study the distribution of the probes. The unique capability of nanoscale sensors to detect biological and chemical substances is complicated by their extreme sensitivity to the sizes, placements, and energetics of the active species, as well as those of cross-reactions. Studying the effects of these factors requires deep physical modelling of these sensors. Mean-field finite-element modelling has been used to quantify the signal variations due to several common phenomena in biosensors. It is shown that poor level of control during fabrication is very likely to result in significant errors in signal reading. This model can also be integrated with molecular dynamics models or Monte Carlo simulations to assist in the study of noise in biosensors. Proper physical simulation will allow the identification of fabrication targets that allow commercial, low-cost fabrication of such sensors with high accuracy and reliability. The authors would like to acknowledge support from the Canada Research Chair program, the Natural Sciences and Engineering Research Council (NSERC) of Canada. In addition, the final version of this manuscript was prepared while Dr. M.J. Deen was a WCU Distinguished Visiting Professor and Waleed Shinwari was a Visiting Scholar at POSTECH, Pohang, South Korea, under the auspices of the Ministry of Education, Science, and Technology Program—Project no. R31-2008-000-10100-0—and their support is gratefully acknowledged.